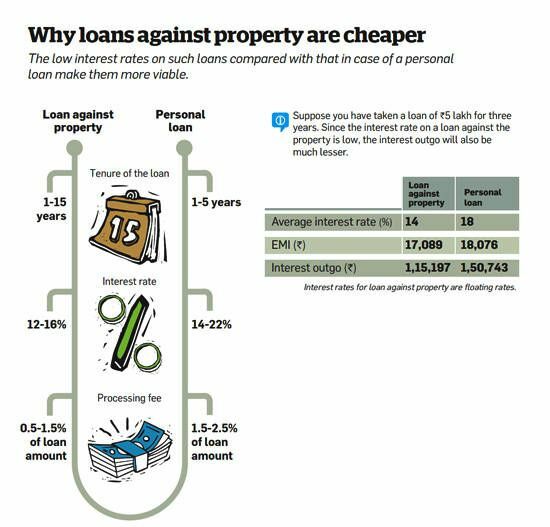 Home > March 2018 > Loan Against Property Vs Personal Loan and Other Loans ..! Loan Against Property Vs Personal Loan and Other Loans ..! 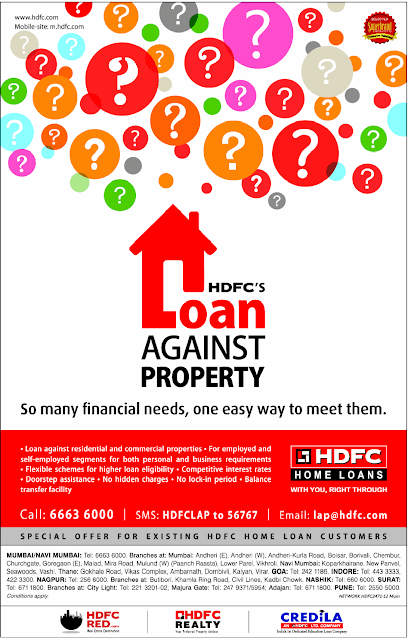 How to Get a Loan Against Property? If the property you are taking a loan against has more than one owner, all of them will have to be joint applicants to avail of the loan. The bank will check all the documents related to the title of the property, as well as ask you for proof of residence, such as ration card, electricity bill or / telephone bill. You will also have to submit a copy of the proof of identity, like a voter ID card, passport or / PAN card. If you are employed, you will have to provide bank statements for the last 6 months, while a self-employed person will have to provide a certified financial statement for the last 2 years. The loan offered by a bank will vary from person to person since it depends on various factors, including the work profile & age of the borrower. Typically, the income proof for 3 years is required to have the loan against a property sanctioned. So, the minimum age is 24 years. Similarly, lenders like banks and Housing finance companies (HFCs) prefer that the loan be fully repaid while the borrower is employed, which is why the maximum age till loan maturity in case of a salaried person is 60 years,while for self-employed individuals and consultants is 65 years.. The bank / HFCs will also check your credit history through the Credit Information Bureau India Ltd (CIBIL) and go through your repayment track record.Based on your credit score and the above documents, the bank will ascertain your repayment capacity. In case you have ever defaulted on any bill payment, it will reduce your chances of getting a loan. After the bank is satisfied with the paperwork,it will offer you the loan, which will typically range from about 50 to 80 % of the value of the property. The main reason people usually do not opt to mortgage their house is that they do not want to take the risk of the bank taking over the property if they are unable to pay the dues. Another disadvantage is that there are no tax incentives while paying the EMIs,unlike in the case of housing loan. However, this is only in the case of a salaried person. A businessman / businesswomen can claim tax deduction on the entire interest amount paid on the loan if he / she can prove that the loan was genuinely used to improve his / her business. However, this tax advantage is also available if the businessman / businesswomen takes a loan against gold or / shares / securities that he /she owns. Loan against shares or securities - PPF and NSC..! The interest rate for a loan against shares or securities, like the PPF and NSC, varies from 12 to 15 %, while that for gold ranges between 14 % and 25 %. In the case of the former, a lender will be willing to offer a loan that is about 50 to 60 % of the value of the securities, while for a gold loan, you will be able to get about 60 to 70 % of the value of the gold you pledge. In either case, if you default, the bank will sell the pledged shares or / gold to recover its dues, which is a smaller loss than losing your house. However, if you need a large amount of money that runs into rupees lakhs, the only viable valuable asset that you may be able to pledge is your home.